After Kenyapithecus, few fossil hominoids occur before the arrival of the australopiths, leaving a 7‑My fossil-less period known as the “African ape gap”. Nevertheless, more fossils are turning up all the time. Samburapithecus, from 9.5 Mya, probably lived before the LCA,[ref]The last common ancestor of chimps and humans, if you have forgotten. 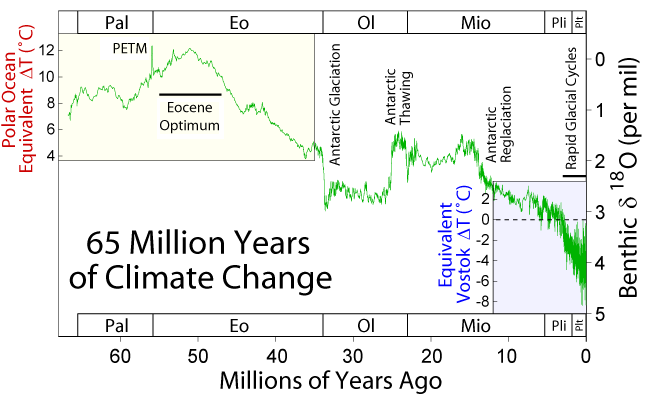 [/ref] which the molecular-clock method dates to between 6 an 8 Mya. 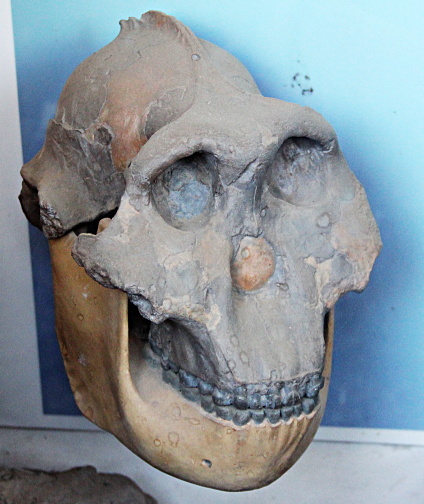 The oldest, Sahelanthropus tchadensis (also referred to as “Toumai”), dated about 7-6 Mya[ref]Some authors cite slightly different dates. In general, we use those of the Smithsonian Human Origins Program, http://humanorigins.si.edu/research. [/ref], lived in what is now Chad, which was then a mosaic environment and not yet a desert. [ref]It goes without saying that the statement that a species “lived” in a place at some time means that its fossils have been found at that place and dated to that time. [/ref] Only a cranium and several mandibles have been found. The cranium is no bigger than a present-day chimp’s, with a small brain and large brow ridges, but its sloping face, its small canines and enlarged cheek teeth arranged in the shape of a C, and the position of the foramen magnum (the relative importance of which is disputed in this case) suggest that it was a hominin, not an ape, and capable of walking upright or living in trees. In this case, it came (probably just) after the LCA, so the fact of its having lived west of the Great African Rift negates the thesis (“East Side Story”) that hominins evolved in eastern savannas where their upright posture, enabling them to see over the grass, could have been an adaptive trait. All hominoids, chimps and all, are capable of walking upright, but can not do so as fast or as far as humans. On the basis of these footprints, it has been suggested that bipedalism did not evolve from quadripedalism, but had always been possible and was instead lost by monkeys and others who became uniquely quadripedal. [ref]Yvette Levoisin, “L’homme de descend pas d’un primate arboricole!”. http://www.hominides.com/html/references/bipede-homme-primate-deloison.php. [/ref] The least one can say is that this idea does not seem to have caught on very much. Another skull from about 3.5 Mya, which has been named Kenyanthropus platyops, is controversial. One paleontologist thinks it is just a deformed skull of Au. afarensis; another, an ancestor of Homo rudolfensis. However, a recent discovery of what would be the oldest known stone tool dates back to 3.3 Mya. [ref]“Wrong Turn Leads to Discovery of Oldest Stone Tools”, http://news.nationalgeographic.com/2015/05/150520-oldest-stone-tools-discovery-harmand-archaeology/[/ref] It was found near the site of Kenyanthropus, so it may have been used by him, whatever he was. The most recent australopith, both for its life period and its discovery, is Australopithecus sediba, who lived in south Africa between 1.977 and 1.98 Mya. [ref]”Australopithecus sediba – new analyses and surprise”, Smithsonian Human Origins Program, http://humanorigins.si.edu/evidence/human-fossils/species/australopithecus-sediba[/ref] Au. sediba has certain details of its teeth, arm and leg length and upper chest like earlier australopiths, but other tooth traits and lower chest like humans. Its discoverers think it is descended from Au. africanus, and that it shows features more like Homo than like any other australopith. For them, it could help understand the transition from late australopiths to direct ancestors of humans, in which case it could link the origin of humans to South rather than East Africa. As usual, not everyone agrees. A study of its teeth finds it to be distinct from east African australopiths but close to south African Au. africanus. On the other hand, a study of its jaw finds it to be distinct from Au. africanus. Although it was bipedal, it had what is described as a hyper-pronating gait, meaning that its feet rolled inward at the end of each step.